The Kobo Vox is a value-priced tablet with a twist. Like its E Ink sibling, the Kobo Touch e-reader, the Vox has a social focus, and places an emphasis on sharing reading experiences. At $200 (as of November 20, 2011), the Kobo Vox is priced the same as the Amazon Kindle Fire and the Barnes & Noble Nook Color, and $50 less than the Barnes & Noble Nook Tablet. Though it lacks the video/music download and streaming options that distinguish its competitors, the Vox deserves notice for coupling e-reading capabilities with the multimedia functions of a basic Android tablet. Of the three tablets, the Vox is the most like a true Android 2.3 Gingerbread tablet--which is both good and bad. The good part: You get many of the stock Android apps that come with Gingerbread (email, calculator, contacts, calendar, clock, browser, gallery, YouTube), minus Google apps such as those for Gmail and the Android Market, since this is not a Google device. The bad part: Gingerbread is more designed for phones than it is for the 7-inch screen of a tablet. The Vox's customized Android interface puts a Kobo-centric spin on everything from notifications to the dock menu to the home-screen reading widget. What's pleasant about this approach is that the Vox doesn't feel like an arbitrary reskin of Android, in spite of the interface's different functionality and look. Rather, it feels as if Kobo simply extended the native Android OS to embrace the Kobo vision, in ways that are tailored for the tablet's reading activities. From initial startup, it's clear on the home screen that this device is aimed at reading first. The customized Kobo Vox reading and shopping apps are well presented, in a manner that other LCD, Android-based e-readers that simply have an e-reader app (such as those from Pandigital) can't match. At the center of the home screen sits a Kobo widget that shows your four most recently accessed books. Below, the usual Android icons are replaced by the Kobo reading dock, which has Read Now, Library, Shop, and Reading Life icons. You can tap at the bottom center of the screen to reveal current chapter info, and a slider for moving around within a book. Annotations are easy to make, once you tap at the top of the screen and select the option; you can see all of them, or just view highlights or notes. You can share individual annotations via Facebook; you can't, however, share them by email, or share all at once, two features that would be useful. While the Vox lacks the distinct glare-reduction techniques found on the Nook Tablet, it does have decent text quality. (Tip: Choose one of the sans serif fonts for the sharpest, least pixelated text.) In my tests using the same book in the same fonts, displayed at similar sizes, in the e-reading sections of the Nook Tablet and the Vox, I found that the Vox was a close second in readability. The Nook Tablet was far less glare-prone, but the Vox's text rendering in that font was very similar. That same font wasn't available on the Kindle Fire--but even when I used the closest match on that tablet, the Vox still presented slightly clearer and easier-to-read text than the Fire did. In our display tests, the Vox struggled, perhaps in part due to the native Gallery software, which had issues displaying sharp, rescaled images. It did well, however, with text from a website screen, and it did a fair job rendering our 1080p MP4 test video; overall it performed better than the vast army of Android 2.x tablets we've seen in the PCWorld Labs. The Vox has a 1024-by-600-pixel FFS+ (Fringe Field Switching) display; FFS+ is similar to In-Plane Switching technology, though Kobo claims that it will render better brightness and color, plus sharper white/gray reproduction. The Vox did outclass the Amazon Kindle Fire's IPS display (and the Fire's Gallery app) when showing our color-bar chart and our grayscale chart. In use, I found that the Vox's lackluster specs hurt its performance. It has a single-core 800MHz processor and just 512MB of memory--two subpar components that contribute to its laggy performance. Simple actions such as page turns felt zippy enough, but accessing menus or loading books often dragged and produced a spinning ball, and games lacked smooth transitions. The Kobo Vox feels like last year's hardware, at least in respect to its boxy, squared-off design. Measuring 7.57 by 5.06 by 0.53 inches, it's noticeably thicker than the Kindle Fire or the Nook Tablet. Kobo says that the Vox weighs 0.89 pound, which puts it about even with the Nook Tablet (0.88 pound) and the Kindle Fire (0.91 pound). But both of those competitors somehow feel lighter than the Vox; the Vox's balance makes it seem heavier than its stated weight. I found my hands getting tired faster when I held the Vox than when I held either rival. 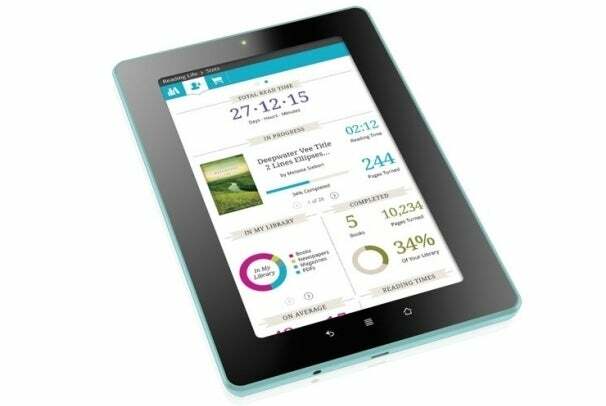 Kobo's Android 2.3-based tablet offers a social-reading-focused, value-priced alternative to the big guns.